Cheap-Chic Decor: Small Space Storage Solution! 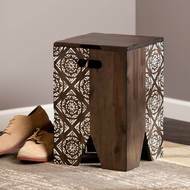 This eclectic storage stool conquers small space seating shortages and storage issue in one piece! The slender scale and interior storage of the SEI Timpson Storage Stool work wonders for small space living. An antique brown finish with ivory patterned accents give this piece a distinctive look. Perfect for an entry, living room or bedroom. The versatile stool moves with the mood, just grab the handles and go.